What about tea? What is it, what is in it, what types are there and what are the differences? What Is Tea? The Basics. At the most basic level the answer to the question “What is Tea?” is a simple one. It is leaves harvested from a specific type of bush where most of the water has been removed without anything else being added. That the skills and techniques in achieving this are so many and varied are what makes it such a fascinating subject and the range of teas available so many and varied. The term tea (at least in English) also has a certain ambiguity to it and if, in the future, you were to summon your virtual assistant to “bring me some tea” the outcome could well be unpredictable. For a start, tea is used not only to describe the dried leaves but also the drink made by steeping those leaves in water. An added complication is that in some circumstances, say in ordering a peppermint tea, there would be no actual dried tea leaves involved – unless that is it happened to be a green tea blended with peppermint. Many other leaves, roots and flowers are steeped in water to produce a drink and although these should more correctly be referred to as tisanes, common usage is most likely to describe these as tea. If you were to subscribe to a news feed with the keyword of ‘tea’ then the most popular topic coming your way would concern places near you where you might find an attractive afternoon tea. Originally a British invention this has now made its way around the world and although tea is usually served at these events the main attractions are the variety of cakes and sandwiches that will accompany it. Even more confusing is that in some parts of the UK people refer to their evening meal as tea (or high tea) which may include a hot meal, pudding, bread and butter but not necessarily any tea. I trust that has cleared things up. 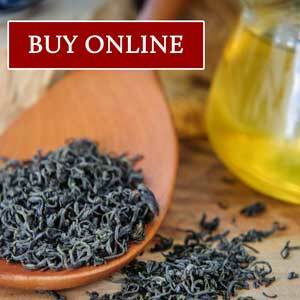 In the very long many thousand year history of tea and the way that we now usually make tea (i.e. steeping dried leaves in water) is a relative recent innovation (only in the last 600 years or so). If this were trendy, like coffee, we might well call this third wave. Go right back to the very early origins of tea as a folk medicine and the leaves would have been used fresh from the tree and indeed some people still make tea in this way today. Drying or processing tea was a means to preserve it and transport it to distant lands. All cultures would have used leaves, roots and flowers at one time either as herbal remedies or possibly for recreational drinking. As an example the English botanist Nicholas Culpepper identified over 400 medicinal herbs in his 17th century publication The Complete Herbal (original published as The English Physitian in 1652 and available to download or read for free from here if you are interested). Despite his research into the medicinal use of herbs, Culpepper died at just 37 years old. That out of all the potential different brews tea rose to become a worldwide favourite is testament to the special properties of this remarkable leaf. In the same way grapes became the preferred fermented fruit in the making of wine (due to the ideal balance of sugar, acidity, water content, skin surface etc.) tea claimed the throne in the non-alcoholic world as a result of the incredible complexity and uniqueness of its leaf content. A tea leaf contains many thousands of chemical compounds but more about this another time. Differences in processing techniques and sequences cause these compounds to interact in ways that result in the different styles and types of tea now available. We now know that all types of tea (green, black, white, oolong, yellow, dark) are made from the leaves of the same plant. It would be possible to make any style of tea from any harvested leaves although the results and quality might well vary. To keep things simple, for now, it would be ‘almost’ correct to say that all tea is made from the same plant species: Camellia sinensis and that there are two main varieties used for the majority of commercial tea production. These are Camellia sinensis var sinensis and Camellia sinensis var assamica – although other varieties (and other Camellia species) are also put forward as sources of tea leaves. The taxonomy of plants isn’t as clear cut (or scientific) as one might think and much of the classification is based on observation rather than anything else. Much more knowledgeable people than me have argued this topic for many years and we shall probably come back to it in more detail at another time. As tea production developed into a huge industry, researchers and planters developed new cultivars (short for cultivated varieties) either to improve pest and disease resistance or in search of particular characteristics that would find their way into the finished tea. Many of these cultivars would hybrids of the sinensis and assamica varieties. The origin of tea is not clear. Camellia sinensis var. sinensis is probably native to western Yunnan, while C. sinensis var. assamica is native to the warmer parts of Assam (India), Burma, Thailand, Laos, Cambodia, Vietnam and southern China. ‘Wild’ tea plants can be found growing in forests, but these may be relics of past cultivation. Left to own devices the tea plant will grow into a small tree of 10 metres or taller. In a farm environment it is typically kept pruned back as a shrub with a height of around one metre to aid harvesting. If the tea plant was indigenous to a fairly broad geographic area, one in which political boundaries have shifted frequently over the time, the development of tea as a recreational beverage and as an industry rests entirely in Chinese culture. Although there is some evidence of tea cultivation as far back as 6,000 years ago the drying and shipping of tea most likely dates back to the 4th or 5th centuries. A sure sign that it was a significant industry is that taxes on it were introduced in China by the end of the 9th century. Today commercial tea production has spread to over 40 countries and totalled 5,300 metric tonnes by 2015. It is generally accepted that the tea plant is native to parts of China, Assam (India), Myanmar (Burma), Thailand, Laos, Cambodia and Vietnam. In a number of these countries, including Vietnam, wild tea plants can still be found growing but are most likely relics of past cultivation rather than truly wild. In Vietnam it is the mountainous area in the north of the country where wild tea trees can be found, usually growing in mixed forests on high mountain slopes. 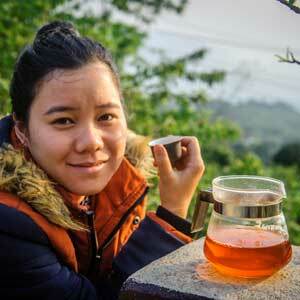 Significant wild tea areas exist in Dien Bien, Lai Chau, Lao Cai, Yen Bai and Ha Giang provinces reflecting the spread of one-time nomadic ethnic groups (particularly the H’Mong and Dao ethnic groups) whose habitation in these parts pre-dates any current geographic boundaries. It is believed that families carrying tea seeds with them as they moved from place to place is responsible for much of the current distribution. There is also a story that an expansion of wild tea planting in the second half of the 19 th century was prompted by bags of tea being accepted as settlement of tax demands by the colonial French government. The alternative was to spend time working in government run factories. 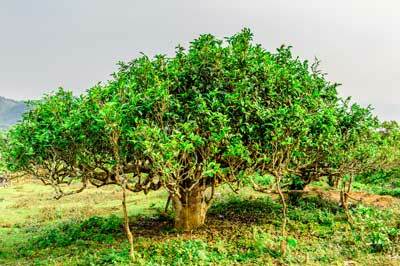 Many extravagant claims are made about the age of tea trees. There are some in Vietnam that are said to have been dated to 800 years old but a best guess is that the majority are somewhere in the range of 80 to 150 years old. Differences in altitude, aspect, soil and climate means that trees grow at different rates making comparison difficult. Without human intervention trees may reach 4 or 5 metres in height. As the trees seed themselves you can also find younger trees but these take many years to reach maturity. 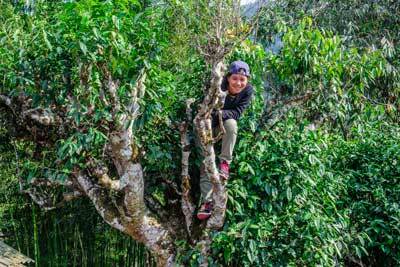 In Vietnam you will often found wild trees referred to as shan tuyet which translates literally to snow mountain. In theory a shan tuyet tea should mean that it is produced from old wild tree leaves but this is not always the case. It is also no guarantee of quality. In recent years, as the popularity of wild teas has grown (particularly demand from China), new plantings of wild trees have been made but at far greater density than the truly old trees. The older trees are typically found in mixed bio-diverse environments – often very remote, deep into the forest and only accessible on foot. All of our own teas are made with leaves harvested from old trees. The climate in the far north of Vietnam is sub-tropical but at altitudes of 1300 metres and above there is more variation in temperature. The mountains are often shrouded in mists causing trees to grow more slowly. Even so the trees can grow up to and beyond 5 metres making it necessary to climb into the trees to harvest the leaves. Wild trees are typically on land cared for by ethnic minority families who will also take responsibility for harvesting the fresh leaves (there is usually no other human intervention other than harvesting.) Families may then process the leaves themselves or sell to other families or factories for processing. With demand for leaves high there is always plenty of selling options and it remains as useful source of income. Having good source material (leaves) only goes some way to making a great tea. The real difference comes from the skill of the tea maker. You can visit any tea district and find a range of qualities on offer from average to excellent. That is where the advantage of careful selection comes in. Old trees with deep roots and slow growth give these wild mountain teas their special character which can be very different to farm grown equivalents. A wild tea may not have the same intensity from the first steep but it will continue to develop, have greater depth and complexity and deliver flavour for longer. Wild teas can be an acquired taste but when you have discovered a good one there can be no going back.